Time flies! And the eleventh month of 2009 is now upon us. November heralds the beginning of a generally wet season for SouthEast Asian countries as the start of the North East monsoon months commence in the region. Usually rainy with strong winds, the final few months of the year is usually 'low season' for butterflies. 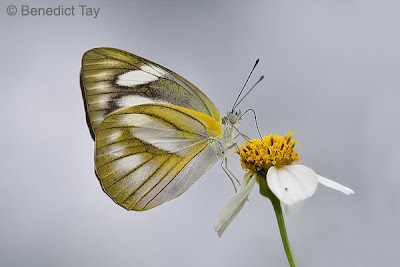 However, due to the north-easterly winds that blow from up north, it's also the time of the year where ButterflyCircle members have observed "immigrants" that are stowaways on the winds that carry them from Malaysia. So in between the rainy days when there are the occasional days of sunshine, there could be interesting finds to celebrate! 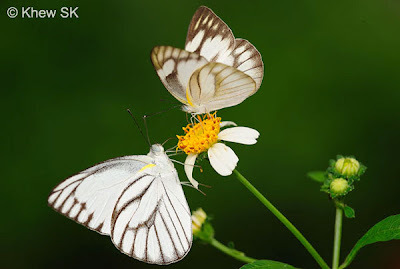 A pair of Striped Albatross shares nectar from a flower of Bidens sp. 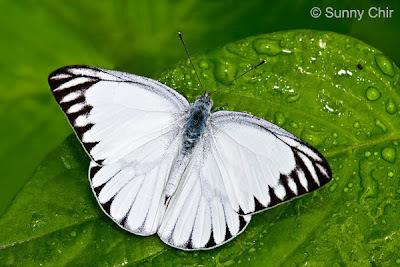 This month, we feature the humble and common Striped Albatross (Appias libythea olferna). 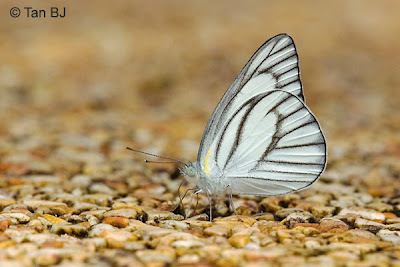 This species, described as rare in the 1960's and 70's, originates from India, Sri Lanka and Burma where it is common. However, it became progressively more common in Malaysia and Singapore in later part of the 20th century. A theory was that as land was cleared and roads opened, its host plant, Cleome rutidosperma, a weed of sorts, became more and more abundant. Usually, in a patch of cleared urban land, this is one of the first weeds to colonise the bare earth. This plant, also often called Wild Cat's Whiskers, is a caterpillar host plant to two other Pieridae species as well, besides the Striped Albatross. 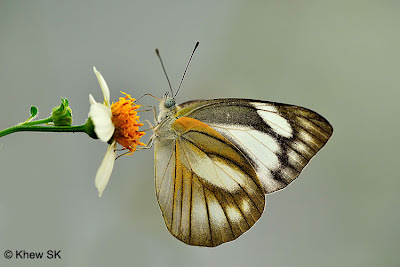 With the availability of the host plant, the species was able to spread easily, and is today a common urban butterfly - in Malaysia and Singapore. 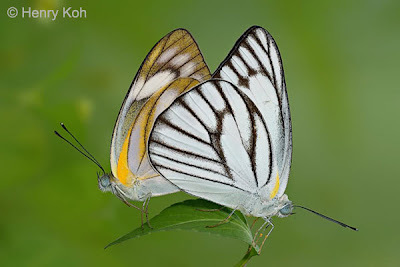 The Striped Albatross is a species that demonstrates sexual dimorphism. The male is white above, with a dentate black border. The undersides have dark dusted veins, and the hindwing basal area lightly marked with yellow. 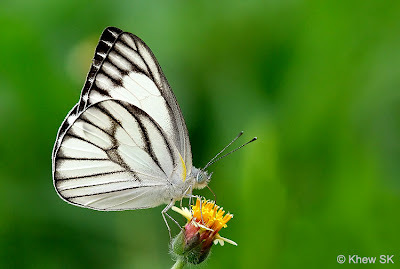 Females are heavily dusted with greyish yellow on both the upper and undersides, and the basal area of the hindwing below is generously marked with yellow. Both sexes have semi-transparent compound eyes and rather hairy in the palpi area. The antennae are banded with black and white and prominently clubbed. All six legs are fully developed. 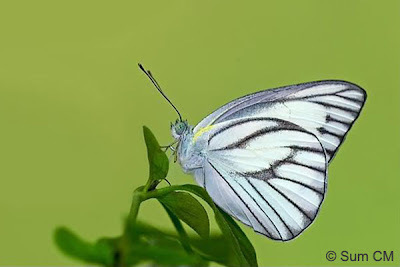 The butterfly is a fast and erratic flyer, the male more so than the female, and are very skittish. They are often best photographed when feeding on wildflowers, although they are still sensitive to movement and will take off at the slightest hint of danger. Photographers have to move very stealthily in order to get a good shot of this species. Males are occasionally encountered puddling at sandy stream banks and paths, usually tainted with animal urine or decomposing organic matter. Both sexes are more frequently encountered in urban parks and gardens and less frequently in the forested nature areas in Singapore. They prefer to fly in open plains on hot sunny days.